As you pass through to Gallery No. 3, you will see on the right a unique display of artefacts relating to the RAF Memorial at Runnymede and its designer Sir Edward Maufe. Opposite this display is a fine collection of WW1 and WW2 Royal Navy sailors’ cap ribbons, etc. In the main gallery No. 3 to your right is the start of a run of illuminated display cabinets, housing what is believed to be the largest collection of Princess Diana memorabilia in the UK. Commemorating the Royal Wedding, births of Princes' William and Harry, Royal visits, etc. 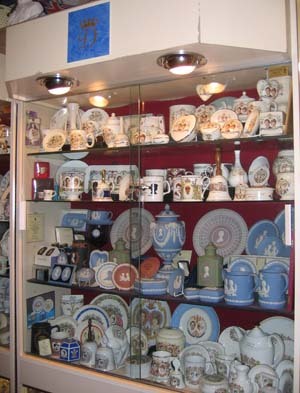 On display are items from a tea tray to a tea service, from commemorative mugs to presentation pieces, a superb Wedgewood display, porcelain pieces from Royal Crown Derby, Worcester, Aynsley, Spode, etc. A fine selection of glasses, decanters, bells, boxes, etc. in porcelain, pottery, silver, glass. This private collection of Mrs Vera Oliver comprises many hundreds of items, all being from the period prior to the death of Princess Diana. 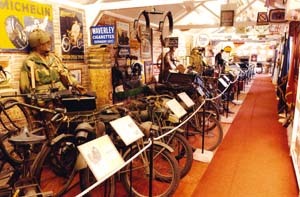 Facing the Princess Diana collection, you will see an extensive collection of WW2 British Parachute Regiment memorabilia to include both 1st and 2nd pattern folding bicycle, large field cycle repair fitted case, fully uniformed and kitted Para Mannequin, Airborne motorcycles by Royal Enfield (Flying Flea), James (Clockwork Mouse), Welbike with canister and glider mounted carrier, DKW (Germany), Simplex (USA), as well as British, German, American (two piece Pam) and Swiss military bicycles, together with Airborne (folding) Carts, Trailers, Battery Chargers, etc. French Captain Jiraud’ two piece Military Bicycle c1890. Pre-WW1 Maidenhead Bakers Cart, motorised three wheel Milkman’s Delivery Carrier with three milk chums, tradesman’s delivery box carrier tricycle, 1 postman with cycle, superb display of 2 period prams from Germany, France and England. An ex-Tilling Stevens horse drawn bus signs c1890, still retaining both enamel boards and all artwork, with the original bus drivers licence, f&g. 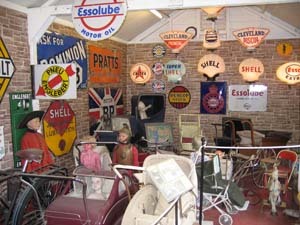 Fine display of pre-WW2 petrol pump and (illuminated) Garage Petrol Pump Globes together with dozens of associated enamel signs, children’s toys and all manner of 1900-1940’s automobilia, pedal cars, tricycles, etc.